It doesn’t matter if you’re using the app or the website, Live Nation is an awful place to deal with. The way they refuse to offer the best seats to those willing to buy them during presale, then allowing flat out price gouging on their site by resalers a short time later, should be illegal! The Better Business Bureau or FCC really needs to investigate. Just purchased two tickets. I have used competitors app with no problems so chose to use app for tickets. Downloaded and installed app, now I get a check network no connection error. I will print my tickets. Live Nation should remove the download option until they assure this app is rock solid and fully functional. App doesn't work at all. Repeatedly opened it and redownloaded it but doesn't load. Blank screen. 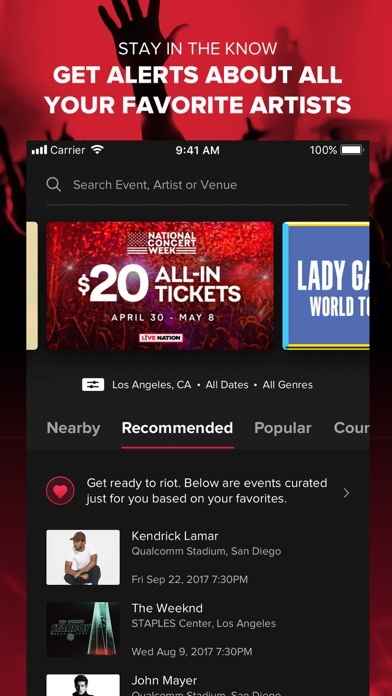 I received an advertisement for Live Nation promoting their $20 concert summer series only available through the app. However, try as I might, the app never loads up once installed. All it does is show the Live Nation banner on the splash screen. REALLY?! Epic fail! I would rate as 0 Star but Apple requires a minimum of 1 Star. Keeps crashing, I’d be afraid to try to purchase tickets on It. I saw all the bad reviews but tried anyways. App doesn’t even load! It stays stuck on the Live Nation opening page. Offers nothing. Complete waste of time. never had problem, paper tickets are history. I’d give them a zero if I could. Lazy designing with lots of issues. Doesn’t load half the time and the updates are setbacks. Multiple times I would find my tickets only to be stuck on a screen that says “Sit tight, we’re securing your Verified Tickets...” only for it to be stuck on that screen indefinitely and me losing the tickets. I’d be lucky to get anything on another site after that loss. Easily one of the worst apps on the App Store. Effing ridiculous 28% fees on tickets, and a near monopoly for some artists and venues. Worse than the new Ticketmaster. Lawmakers ought to investigate this BS. 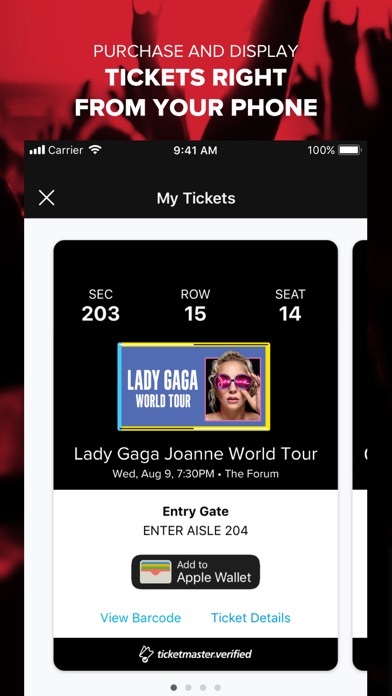 It’s super easy to access tickets using the app, but it crashes frequently, often before you can show it to the person to scan, meaning that you’re holding up the line trying to get it to work. If they could make it more stable, it would be great! Every time I try to open the app it won’t load and it’s been this way for months. I wouldn’t even biter if I were you. When attempting to view 'my tickets' section app crashes immediately every time. Edit. 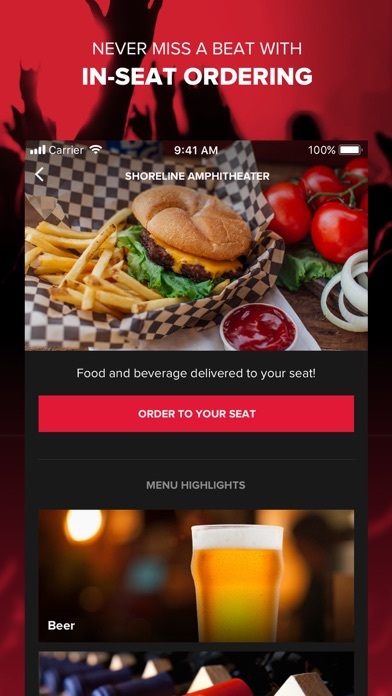 App let's you now view your tickets giving you a false sense of hope. When you get to the venue and the app is so over loaded that you can't login good luck! Had to resort to using my credit card to access my tickets manually with the venue. Luckily I had it with me. 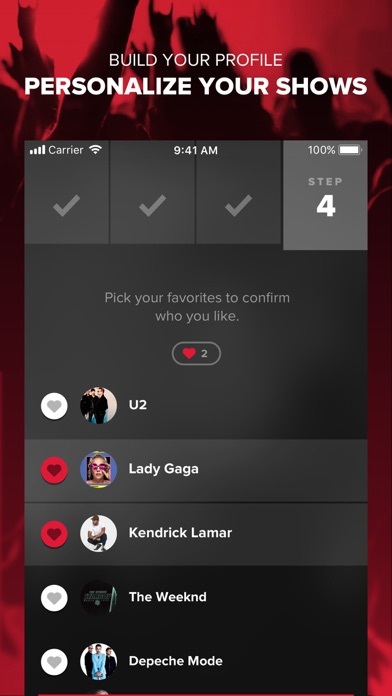 Take your credit card because this app will fail just like live nation. What is so hard about printing tickets? For the $30 in fees I paid I can't get a ticket that costs $0.10 for you to print? I never even got to see if I could get to my tickets. I restarted the app multiple times and couldn’t ever get to the menu choices. This is ridiculous because I can’t print them so now I have to change to will call. What a terrible app, poor business choices, and unhelpful suggestions for fixing the problems. This app is a joke, I used it two days in a row for tickets that were to be released at exactly 10 o’clock. Two days in a row I was on only to have tickets sell out within the first minute. Within the first three minutes amazingly the tickets were back on sale for double the original amount. What a scam marketplace. I would not recommend doing business with this app. I would give this app less than one star if I could. Took forever to load. Didn’t get pit because of this terrible app... the Ticketmaster app works way better.. isn’t TM owned by Live Nation?!? Why not merge??? Terrible experience on this app.. if you have the option to use desktop I 100% recommend doing that. Never works to actually find and buy a ticket. Especially if it’s right as tickets go on sale. If it finds seats, it will fail to let you purchase them. It’s a very buggy app that often crashed. But now I cannot even open it. Livenation and Ticketmaster really need to get together and figure out who does what. I bought tickets online, and I couldn’t view the digital tickets (QR code), neither through the full browser on my PC nor through Safari on my iPhone. The tickets also weren’t emailed to me. I don’t want to download a crummy 60MB application that wants to track my location and offer me other local concerts, I just want to take a screenshot of my tickets... and that shouldn’t require downloading the app. This is irritating, customer-hostile design. These companies trap you by making you download the app. The app doesn’t even work. Won’t move off the loading screen. This might be the worse app, for a large company, out there. There is no matching correspondence between anything on the site and it’s app, which makes this app completely useless. The app glitched while I was purchasing and charged my card twice for non-refundable tickets. Now I’m out $250+ - do not use this app. This app is absolutely worthless!! App constantly gives the message "The Request Timed Out". Search engine does not work! Would give Zero stars if itunes allowed!! Every time tickets go on sale the app glitches. Either your log-in info doesn’t work, you can’t find the artist/event, or the app just won’t load properly. Every second up until the tickets go on sale the app works perfectly, then BOOM! ..and the scalpers buy up all the tickets before you can get 1. Thanks Live Nation. Absolutely terrible. When opening app I get home screen then a blank white screen and can’t do anything. Where does all of the ticket “fees” go to if it’s not making a functional app. As many have said, you sincerely put your tickets at risk if you choose the “app only” options. Utterly unreliable. Don’t say you weren’t warned! Do they just don't care about fixing this app? Downloaded it and tried viewing my tickets and it says "void" yet I bought from them. Better be another way to get them when the concert time comes otherwise they might as well refund me my $90. I downloaded this in order to have easy access to my digital tickets on my phone. Logged in fine, but clicking on “My Tickets” briefly displays a list of my tickets and then the app immediately terminates. So this app is effectively useless. The app was fine. I've used it a couple of times successfully. I had to delete it when I found out it was draining 9% of my daily battery life on average. Admittedly, I have an older iPhone 5c. That's still unacceptable. Downloaded for ticket access. Logged in successfully. No tickets show. If I have to use a browser to access tickets why have the app at all? Won’t let me pick my specific seat off the seat map! Just used it to get Judas Priest tix. If you're already signed in it's a breeze. Obviously it takes longer if you have fill in your personal info. I used to love the features it used to have, like bios, set lists and such. But, I'll settle for the presale alerts and speed of transaction. How did this app suddenly go from having universally awful reviews to shining ones? Something sketchy going on there! 🤔 I have never been able to use this app to buy tickets. Either the show isn’t even listed anywhere in the app, or there’s an error when you try to buy the tickets. Massive ticket-selling corporations are a sad fact of life, but use the Ticketmaster app instead. It actually works! Absolutely love this app. I can favorite all my favorite artists, get notifications when and where they’re playing locally & most of all get reward points on my Citi Thank You Rewards Credit Card. Got tickets to Green Day's House of Blues Cleveland show that sold out in minutes using app vs my iMac which couldn't even connect to the ticketmaster site due to 'unusual volume' !!!! App really needs work as it moves brutally slow. Am losing faith in LN as a source of tix. I cannot believe how much extra money I paid just to purchase tickets through this company.. with no other option to buy from other dealers. It cost me an extra $100 just to buy tickets.. THAT IS ABSOLUTELY OBSURD. I was forced to make a donation to a charitable organization. It was automatically included and I could not remove it. My charitable donations should be decided by me not livenation or an artist. Also fees are ridiculous. I just paid $50.50 per ticket that we’re listed for $35. That is a 50% markup for fees to a venue OWNED by Live Nation. This is absolute extortion. Just say the tickets are $50! Unbelievable. I was able to add a new credit card, search, and purchase tickets in the time that it gave to buy tickets. Very easy! Checking out and trying to enter a new card number has changed and I don’t like it! It was very confusing and crowded. I always use this app to buy tickets! It makes it super easy when it comes time to check into the concert. Tried for 40 minutes to buy a pair. Would not allow it. Only singles. Hate how there’s $11 charge or more on a freaking ticket. Live nation is a monopoly. Although I was prepared at the designated time, the app did not allow me to purchase for 10 minutes after the start time, and as a result reserved presale seats sold out before I could purchase any. Very disappointed Live Nation App would not accept my Active Voucher Discount Codes from Schlesinger Class Action Lawsuit for purchase of concert tickets today. Extra fee is getting out of hand. 40% fee is getting ridiculously out of hand. 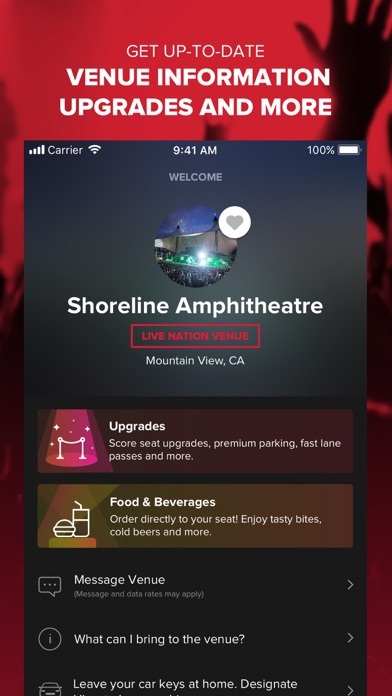 This is my first time downloading this app and ordering tickets through the “Live Nations App” and I did not have any problems purchasing my tickets. Spent one hour trying to get tickets. Like the app, Hate the site! I like to purchase concert tickets using my laptop so I can pick and choose and compare seating. Much easier to do when not using your phone so you don’t have to hunt and peck. The app was good but the website horrible. The app recognized my password but the website doesn’t know who I am, you would think they were written by two different developers! Very frustrating experience while you are trying to get tickets especially during pre-sale. Should have given me the insurance charges up front. Not cool Live Nation. Not cool. $16 a ticket is a joke. Then you want to sell me insurance for an additional $8 on top of a ridiculous price for a ticket. $1016 a ticket. You people have lost your mind! And I thought Gene was greedy! Tickets I purchased were 40 apiece, but I was charged 105. The app said that I would get an accounting at checkout. Did I? I did not. What’s the other $25 for? Why not tell me how much the tickets are to begin with instead of adding all this fee bs and not even telling me what it is?? Seems they hook you in with the pre-sale, you go through the purchase than they say, “It’s not you, it’s us.” and kick you out. Then the next time I went thru purchase and there was still time on clock and they said somebody beat me to it. The THIRD time I was on, I saw the seat I wanted previously (the one they said someone beat me to). The fourth time my credit card was declined. The fifth time they said I couldn’t use same device so I had to use my phone. I used the same credit card they said was declined previously and that finally worked. The games these monopolizers use should be stopped. OMG! Absolute BS. Just re-downloaded the app when I purchased tickets for an even through live nation, expecting to be able to download my tickets into the iphone wallet (which the app claims to be able to do). However, once I logged into my app it showed the tickets in there, but when I try to view them the app crashes every time. Thankfully I had the option to print the tickets for free because the app is utterly useless! If you have an old live nation account with a password that doesn’t meet their current password standards, you cannot login on this app. I’ve had an account with an all alpha password for a awhile. Works great on a browser. Installed this app amd it says “enter a valid password”. So they are checking password format BEFORE bothering to see if that really is your password. I know because I changed my password on a browser (had to conform to new format) came back to the app and it works fine. Don’t make the mistake of downloading and relying on this app. I downloaded the app and was not able to access my tickets. Luckily the box office had a way to check out our tickets using an ID. All of my friends had to do it this way as well because the app would not load their tickets either. This app doesn’t show events or are late on the onsale. Then when it does show up it’s a map when website people are just searching Tickets. I can never actually cart anything. Not sure what the plan is for this app but it doesn’t work. When I log into account on the live nation website the tickets for my event show up. They do not show when logged into the same account on the app. Just installed the app ten minutes ago. Hope they fix soon for convenience sake. I was trying to buy concert tickets and the app was constantly crashing before purchasing so I kept trying to get them again. I got charged every time and love nation wouldn’t return my money. Honestly never felt so cheated by an app/company. Had to buy 2 tickets. Because you lost mine. Bought a ticket about 3 weeks before a show in Detroit, checked the day before. The ticket was there. Got to the man who checks the ticket the day of. Opens the app no tickets. Went to my email checked everything. And it was gone. Couldn't be found. Had to buy a whole new ticket. Unacceptable, you guys own me 40 bucks. I can sign in on the Live Nation website to buy and view my tickets just fine but when I use the same credentials to login to the app it says my password is not valid. Pretty lame. I've already deleted the app. This app is terrible. Won’t load anything. Tried on multiple devices, and on all of them I’m getting a connectivity error message. Awful app. Doesn’t work how it should. Unable to buy tickets after hours of pre-sale drama and reloading and holy moly it’s soooo infuriating. Terrible job live nation. App is trash and doesn’t work. I’ve downloaded it on 4 different devices trying to buy presale tickets and each one gives the same recurring “Request timed out” message before it can even load the front page. Fix the app so people can actually buy tickets. Waste of hard drive space. Terrible app. Doesn’t function at all. Fails on startup ever time claiming connectivity issues in my settings. No explanation for error and I have no problems with any other app.